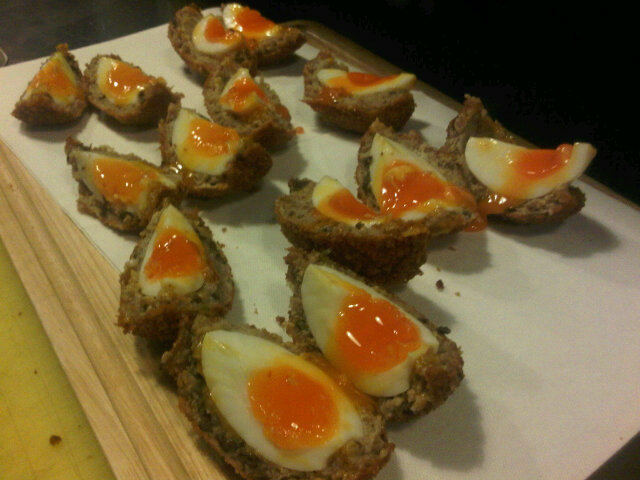 A few weeks ago I blogged about the upcoming Scotch egg challenge. Well, last night was the night we were all waiting for. Scotch egg heads gathered at The Ship in Wandsworth to taste and then crown the best homemade Scotch egg. Without further adieu, let me congratulate The Devonshire Arms in Chiswick. And the winning Scotch egg was from The Devonshire Arms in Chiswick! I’ve never eaten a Scotch egg. Their mere sight, particularly when cold and purchased at a service station, makes me want to gag. But I love the look of that gooey yolk and crumbly breaded exterior. Posted on 21, September 2011, in Food and tagged British, food, pub food, scotch egg. Bookmark the permalink. Leave a comment.